Reverse Mortgages and Linked Securities is a contributed title comprising many of the leading minds in the Home Equity Conversion Mortgages (HECM) industry, including reverse mortgage lenders, institutional investors, underwriters, attorneys, and regulators. This book begins with a brief history of reverse mortgages, and quickly moves on to discuss how the industry has evolved-detailing the players in these markets as well as the process. 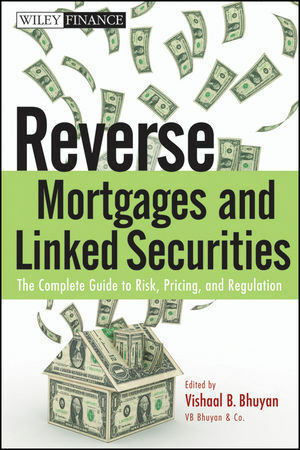 It discusses the securitization of reverse mortgages and other linked securities and includes coverage of pricing techniques and risk mitigation. This reliable resource also takes the time to cover the current regulatory environment of the HECM market, which is constantly changing due to the current state of the real estate market. If you want to make the most of reverse mortgages and linked securities, take the time to read this book. Vishaal B. Bhuyan has been involved in the "life markets" for over five years and has focused on analyzing and investing in life settlements, reverse mortgages, and other linked assets. He has advised a number of large investment funds on the longevity and mortality risk asset class and has been invited to speak at various investment and industry-specific conferences across the United States, Europe, and Asia. Bhuyan is also the editor and coauthor of Life Markets: Trading Mortality and Longevity Risk with Life Settlements and Linked Securities (Wiley) and will be releasing The Esoteric Investor (FT Press) in 2011. Part One Reverse Mortgage Basics. Chapter 1 Reverse Mortgage Primer. Chapter 2 The History of Reverse Mortgages – an Insider's View. Fannie Mae Stakes a Claim to the Marketplace. Roots of the Securitization of Reverse Mortgages. Chapter 3 HECM Explained Reverse Mortgages Originated through the Home Equity Conversion Mortgage (HECM) Program. Legislative History and Program Fundamentals. Disbursing Funds and Calculating Loans and Interest. Changes to the Program Following the 2008 Act. Consumer Focused Elements of the Program. Part Two Underwriting and Risk Analysis. Chapter 4 Underwriting Reverse Mortgages. Life Settlement versus Reverse Mortgage Underwriting. Simplicity of the Current Reverse Mortgage Underwriting Process. Proposed Elements of Reverse Mortgage Underwriting. Chapter 5 Risk Mitigation from Existing and Proposed Financial Products. Chapter 6 Longevity Risk and Fair Value Accounting. Longevity Cost Calculator™ as a Loan Underwriting and Pricing Tool. Suggested GAAP Compliant Methodology to Standardize Life Settlement Underwriting. Chapter 7 Risk Mitigation Available Hedges & Products in Development for Risk Transfer. Hedging Crossover Components in the Capital Markets. Chapter 8 Criteria for Rating U.K. Reverse Mortgage-Backed Securities. Overview of Reverse (Equity Release) Mortgages. HPI in Years 16 to Legal Final Maturity Date. Chapter 9 United States Federal Income Tax Aspects of Reverse Mortgages. Deductibility of Interest Payments on Reverse Mortgages. Securitization of Reverse Mortgage Loans Through REMIC Structures. Practical Observations Regarding Investment Reverse Mortgage REMIC Securities. Part Four Reverse Mortgages in Context. Chapter 10 Unlocking Housing Equity in Japan. Implementation in the Japanese Context. Feasibility of Reverse Mortgages in Japan. Chapter 11 The Secondary Market in Home Equity Conversion Mortgages. The Reverse Mortgage to Liquidate Home Equity. Cash Flows, Risk, and Uncertainty. The Secondary Market for HECM. Longevity Risk Embedded in HECM. The Constraints of the Underlying Asset. Appendix A Housing Wealth Among the Elderly. How Risky is Housing Wealth? Do the Elderly Decumulate their Housing Wealth? Appendix B: Reverse Mortgage Analytics. Determining the Payout Values: Practical Considerations. Computing Payout Values: An Example.